Product prices and availability are accurate as of 2019-03-10 12:30:23 EDT and are subject to change. Any price and availability information displayed on http://www.amazon.com/ at the time of purchase will apply to the purchase of this product. 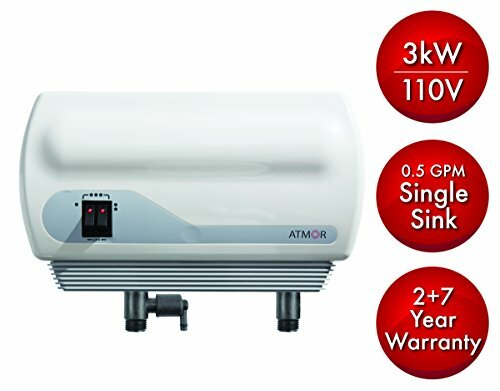 SAVE ENERGY, WATER, MONEY, TIME – Atmor offers the efficient and convenient water heating solution you have been looking for. 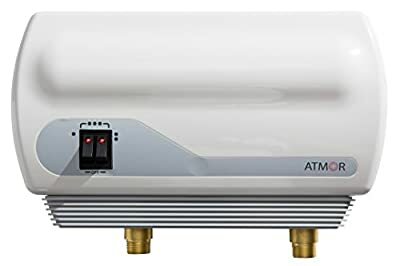 Atmor 3kW/ 110V Point-of-Use Tankless Electric Instant Water Heater provides an unlimited flow of hot water without the wait or worry of ever running out. That’s right, instant hot water on demand! 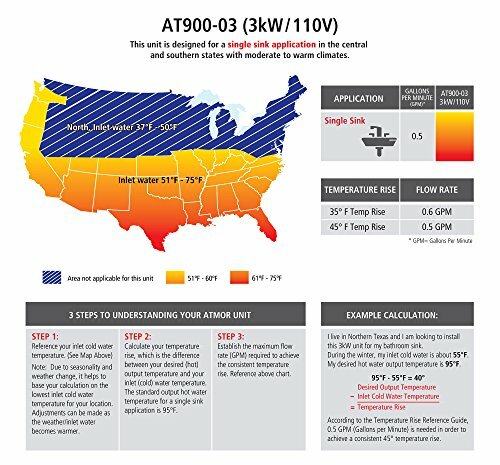 This unit is specifically designed for hand washing SINGLE SINKS in areas with at least 57°F ground water temps (See Sizing Guide). Please note that this unit will not operate properly in Northern regions with inlet water temps colder than 57 degrees. A flow rate of 0.5 gallon per minute (GPM) is required in order to achieve a 45° temperature rise. Perfect for residential and commercial use, this compact unit can be installed against the wall either under the sink out of sight or near the point of use. Unit requires a 30 Amp dedicated single-phase breaker. This is NOT a plug in unit. Required wire size: 10 AWG. Standard 1/2" NPT (straight thread) fittings. Maximum flow rate is 0.5 GPM. Maximum temperature rise possible for unit is 45°F. For safety reasons, the included Pressure Relief Device (PRD) included must be installed on your water heater per the instructions in the owner's manual. In order to achieve maximum performance, it is recommended to install the included 0.5 GPM sink aerator. Failure to comply with the installation and operating instructions in our Owners Manual or improper use will void the warranty. 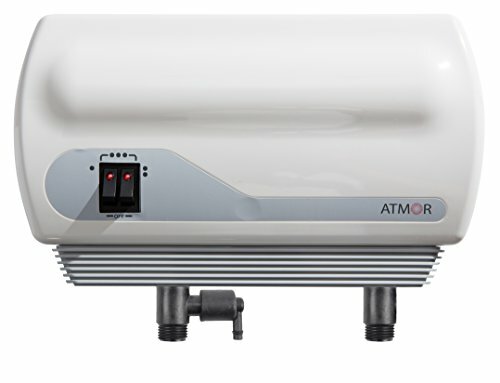 The water heater must be installed by a licensed electrician in compliance with all local and building regulations.